I’m among those who have lived through the age of the radio and appreciate the role this instrument played in the progress of communication. I own two Bose radios, a discount store “special” radio, and a wind-up broadcasting object that I used during two hurricanes. I once had a short wave and a radio devoted especially to weather reports, and I also have an XM radio in the car that features international stations, old radio shows, NPR, Nashville country music stations, etc. The two Bose radios and the discount “special” are plug-ins, and the other day when the storms hit Sewanee and knocked out the power, I had no battery-operated radio. After sitting in a news-less world overnight, when I didn’t know whether a tornado was headed our way and all my neighbor’s homes were dark and silent, the following morning we went to Monteagle where power had been restored, got a cup of coffee at McDonald’s, and made a quick trip to Fred’s to buy a battery-operated radio. Meanwhile, I have the little black box which I turned on this morning and received the news that Franklin County High School had been awarded a special recognition for collecting 5,000 pairs of jeans, more than any high school in the U.S. for a “Teens for Jeans” program. This was laudable news, but after listening to more than two pages’ worth of ads that support this station, I gave up and went back to meditating on modern electronics and how addicted I had become to news that spewed from the television set. Radio is really in my bloodstream since I grew up in the 40’s and listened to such programs as “The Shadow,” “The Lone Ranger,” “Let’s Pretend,” and the “Inner Sanctum.” In the 50’s, I cherished the radio because it was a way of passing time during our sojourn in snowy Limestone, Maine where my former husband had been sent as a radar specialist. Listening to Tennessee Ernie Ford’s radio program, while keeping warm under an electric blanket, became a nightly habit until we returned to Louisiana and bought a television set. 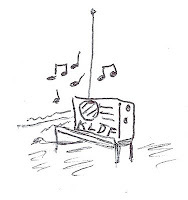 My grandfather Paul loved radio and had a Special Land Station, KFLD, back in the late 20’s. He performed radio experiments for the government to help develop the science of radio communication. Grandfather took over a back bedroom in the old Victorian house in Franklinton, Louisiana and set up radio equipment there. He enjoyed radio work until lightning struck the room and set it on fire – luckily the fire was quenched before the rest of the house burned down, but, following the fire, my grandmother declared that Grandfather should take up a new hobby. However, I don’t think that gardening ever supplanted his love of operating a radio station. 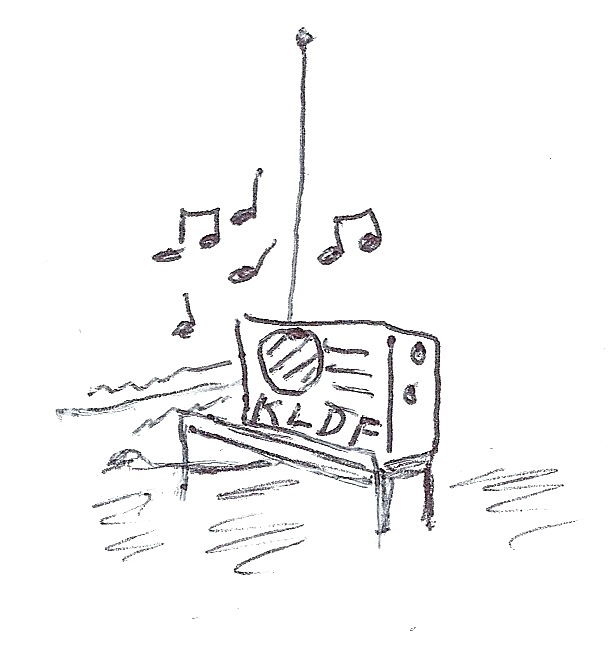 When one of my daughters began carrying a boom box around with her during her teen-age years, my love affair with radios suffered a temporary hiatus, but she grew up and discarded the boom box, and by then, I had begun to rely on television for the news. Meanwhile, the small black object sits on a side table in the dining room and begs for listening, and I’m thinking about turning it on at noon to see how many fresh vegetables, sump pumps, refrigerators, and pest control services I can buy before I find out whether another storm is headed this way. Over a week ago, I flew down to Florida and, three days later, flew to Pennsylvania with my friend, Vickie, her mother, and her mother’s caretaker. Before I departed I went through many trepidations about flying again, since the last trip I made five years ago resulted in my being stranded in the “basement” of the airport in Houston at 11 p.m. when all the airlines had closed up shop. We rode through a rain storm in a rented car, driven by a kind doctor and his wife who took us to Lafayette, Louisiana and arrived at 3 a.m., early enough for the doctor to perform surgery at 7 a.m.! When we reached New Iberia that morning, I set down my bags with a loud thump, declaring that my flying days were over. However, after making three or four 14-16 hour trips by car, I was encouraged to attempt flying again and scheduled the Florida/Pennsylvania trip. The flying was smooth, but handling baggage, trams, rental car, required a little more juggling than I liked. What a weenie I was, I told myself. During the 40’s, I traveled across the deserts of Texas, Arizona, New Mexico, and California with my family in an old blue Ford coupe carrying two adults, three children and a cocker spaniel dog, waterbags on the hood, the windows cranked open to let in the smothering desert air, and I can’t remember complaining about our mode of travel. Also, in the 40’s, I remember my father driving through flood waters following one of Louisiana’s many deluges, the flood waters creeping over the running boards of the same blue Ford and my father swearing when my mother wanted to rescue a dog from the swirling waters. We felt that it was an adventure to motor through the flood, and I never thought about the danger of the engine failing or anyone drowning. Peripatetic by nature, travel was exciting to me, beginning with the adventures of the 40’s and culminating in the air trip five years ago. I made the Florida/Pennsylvania excursion but I’m not sure that I’ll muster up enough moxie to book another flight any time soon. I never lived in an area of Louisiana that used buggies for transportation, but I came across an article the other day about the use of buggies for travel in south Louisiana, in particular, Church Point, Louisiana. Church Point was the last town in south Louisiana to give up buggy travel and earned the title of the “Buggy Capitol of the World” during its heyday. 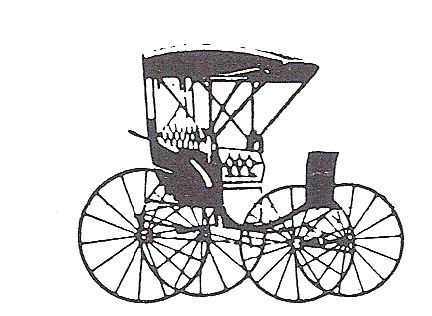 Until 1941, buggies in this south Louisiana town were the only mode of transportation, excepting feet and horses, and the Acadians came in second as travelers in these vehicles – the Mennonites and Amish took first place as buggy users. Theo Daigle and Bros., Inc. sold the last buggy in the town of Church Point, Louisiana in 1948! Buggies were lightweight and easy to repair and were drawn by horses ranging from gentle mares to handsome steeds that carried young men on courting ventures. According to Pierre Daigle, writing in “Acadiana Profile” magazine, buggies were used during the early days by oil explorers in marshlands and swampy places of south Louisiana where trucks and cars couldn’t navigate. Doctors, mail carriers, traveling priests, and salesmen used the buggies to carry out their jobs. Daigle included an amusing note about the measurements of a buggy cushion: it was only 31 inches long and 17 ½ inches wide, and when two adults shared the cushion, there was little room for derrieres. Daigle recalled that he often saw men as small as Jack Sprat riding with their large wives and keeping one foot outside the buggy’s chassis as if they were about to leap out of the buggy. If you think that there isn’t much leg room in a modern airplane, consider the size of those buggy cushions! My great-grandmother used a buggy extensively for going into the countryside, seeking rural churches where she established women’s missionary societies, and often paid tribute in her autobiography to “faithful Nell” who pulled her small black buggy over many rough country roads so she could do her missionizing. Her experiences will be included in a new novel which I’m presently writing that includes reminiscences about her and my great-grandfather, who fought in the Civil War. It’s called REDEMPTION, and I hope to have completed it by the time I return to Louisiana in the Fall. Actually, I’m really grateful for the advances in travel and experienced smooth flights to and from Florida and Pennsylvania, but the truth is that I’m a provincial soul and prefer traveling in my Honda Hybrid on the back roads of Louisiana, the Carolinas, Georgia, Alabama, and Tennessee. Yesterday I received an e-mail from a friend who owns a small, feisty dog whose name I won’t mention for fear of embarrassing both dog and owner with my story about certain dog misbehavior that occurred recently. 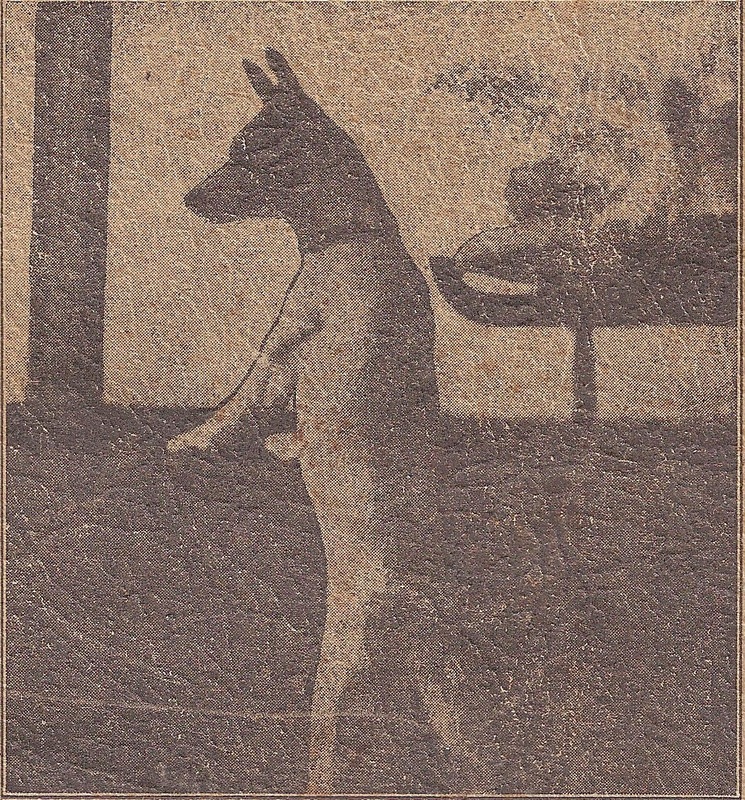 It seems that the anonymous dog, who obviously had more curiosity than sense and sharper teeth than most of her canine cousins, picked up a check I had sent to my friend that had dropped to the floor while she sat at her desk preparing a deposit slip. The dog in question didn’t quite know how to handle money, but with her intuitive female dog faculties knew that money is something most humans drool over, yodel about, and base their lives upon. So she tore the check in half and ate one half. The check did nothing for her taste buds, and what it did for her digestion is not worth writing about. Furthermore, she couldn’t even brag about obtaining a $100 check because it wouldn’t help her status in the canine world as dogs don’t give a doggone about money. I plan to re-issue the check and will request that my friend wait for the dog to bed down for the night before she prepares another deposit slip. That was the first incident about dogs and their exotic appetites. The second incident involves my old tennis shoes, which, after miles of walking, raking, and wading through mud, had achieved that scruffy look dogs admire. They carried a palpable scent that reeked suspiciously of wet dog hair, so…So when I left them on my front doorstep one night, I discovered them the following morning in the yard, minus toes and heels, chewed to death. I peered through the dining room window and spied a white dog with oddly-shaped black patches, sniffing around a large blue beach ball he had obviously stolen from the dormitory next door and was attempting to swallow it. You can picture the results had he succeeded. for a friendly tickle and rub. For such four-legged fealty – well! And so much for dog food and doggerel! I will be away from my desk for over a week and am putting the lawn chairs indoors because who can tell what's next on a canine’s menu? 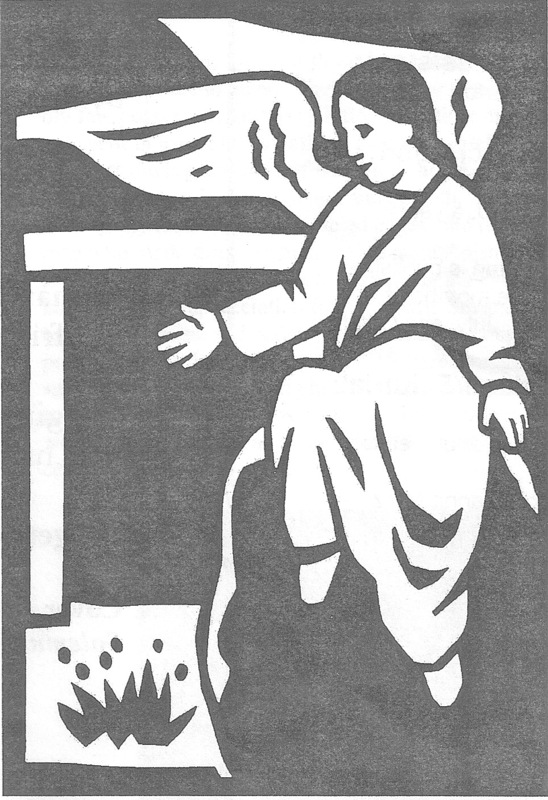 This morning I’m re-reading a copy of a column entitled “Sacred Space” that appeared in “Tuesday Morning,” a Sewanee publication edited by my good friend, The Rev. Dr. Susanna Metz. Susanna is the professor of Contextual Education at the School of Theology here at the University of the South and has often appeared in my poetry as the Tuesday morning preacher at St. Mary’s Convent where I attend Morning prayer and Eucharist some weekdays. Cuthbert’s Island seemed to be the favored choice of Susanna’s adventures to the islands. There, she visited the sunken area surrounded by rocks that mark where St. Cuthbert’s hut probably stood. A towering cross marks the place, and pilgrims like Susanna often place stones and shells at its base. I was saddened when Susanna didn’t become the Bishop of Northern Michigan (even though she was one of two finalists), but everyone at St. Mary’s breathed a sigh of relief that she didn’t leave us sans our Tuesday morning prophet. U.S. journalist and explorer Henry Stanley once dubbed Africa “The Dark Continent” because the country seemed to be a mystery to Europeans of the 18th century who thought it had no civilization at all. Mapmakers even left Africa a dark color when they drew their maps – it was a country regarded as a harsh, sub-Saharan desert. Later, Europeans exploited the country’s resources, but gradually Africa lost its designation as “The Dark Continent” and came into its own as a fascinating civilization of sunshine and light. One of my closest friends, Jane Bonin, served in the Peace Corps in Malawi and Niger, Africa for a decade, returning stateside to settle in Washington, D.C. During the years following her sojourn, she has often told me about falling in love with Africa, and several years ago, she began writing vignettes about her experiences in Malawi and Niger (http://alionseye.blogspot.com) which she hopes to include in a book about Africa. 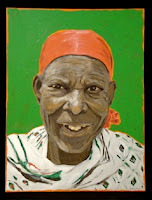 Last week, I lunched with Barbara Hughes, another friend who teaches Spirituality and Art at the Sewanee Theological Seminary on The Mountain, and she told me that after spending a half year in Tanzania, Africa in 2010, she experienced the same feelings as Jane: she fell in love with Africa. 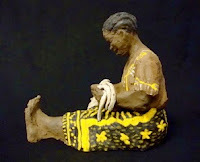 Barbara is noted for her paintings and sculpture and has captured the colors and characters of the women of Tanzania in a show featured at Shenanigan’s in Sewanee. 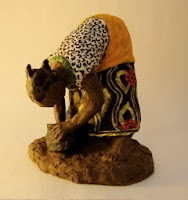 Her art is derived from that overwhelming love she feels for Africa, and is an exhibit of vividly-colored stoneware sculptures and paintings that feature the bright clothing worn by women in the villages of rural Tanzania. “I was invited to come to worship services and to give talks in these villages,” she said. “The warm response of the people there was overwhelming and humbling. Life is hard in these villages and people live in small mud houses, constantly struggling for clean water and for food. The food they grow is dependent on the rains.” She also reported that rampant diseases like malaria afflict families in the villages. “Village mothers often have to choose between feeding their families and sending their children to school,” she noted. “At the Sunday services, there’s always a group of mothers called The Mothers’ Union (Uwaki) who dance, drum, and sing, and the sounds of their harmonies ring in my ears still.” According to Barbara, members of the Mothers’ Union also meet to deliberate village issues. 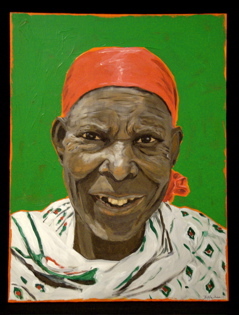 The first painting included in this blog is of a village woman named Nongwa, a portrait that depicts the humor and joy these women feel, despite their lives of hardship. The two stoneware sculptures are of “A Woman Weaving” and of “A Girl Cleaning A Bowl.” Both are almost whimsical in depiction and embody movement even in the stillness of the sculpture. The Women of Tanzania remind me of Alexander McCall Smith’s female characters in THE NO. 1 LADIES' DETECTIVE AGENCY featuring Precious Ramotswe of Botswana, South Africa. The Women of Tanzania display the same pride in their country and joy in living there as those of Smith’s characters in Botswana. 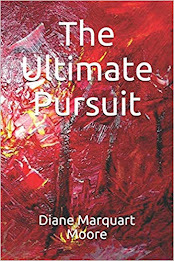 One of Barbara’s pieces of art is worth more than 1,000 of my words, and the colorful characters presented here are examples of the way she captures the joy in human faces and forms in all of her art. Barbara says that twenty percent of proceeds from the sale of these paintings and stoneware sculptures will go to the Womens’ Center in Msalato, Tanzania.